Disposable, non-sterile, soft and flexible; lightly powdered with absorable cornstarch dusting powder, seamless with beaded cuffs, premium quality, ambidextrous; textured surface & fingertips for sure grip; FDA medical grade. Gloves natural in color. 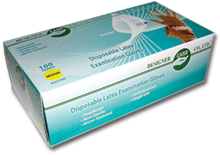 Each box contains 100 single-use powdered latex gloves, to be used on either right or left hand.